Getting back into cooking since 2009. I'm sure that Italians would be horrified at such a bastardisation of their cultural legacy, but chocolate pasta with creme anglaise (that's 'custard' to you and me) is very, very tasty. Sift the flour, cocoa and sugar onto a clean board or bench. Make a hole in the middle, crack in your eggs. Mix well, then knead until silky smooth (this takes about 10 minutes of hard kneading). Leave to rest in the fridge for half an hour or so wrapped in glad wrap, then cut in four and roll out using your pasta roller. 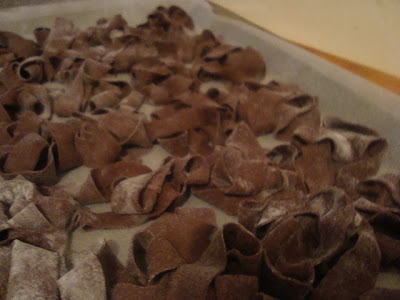 I found that I could only take it down to a 6 or 7 on the rollers before it started to break up; the cocoa is not as pliable as a pure-flour pasta. This recipe comes from the very reliable Ratio by Michael Ruhlman. Combine the milk cream and vanilla bean in a sauce pan and bring to a simmer. Remove from the heat and let the bean steep for fifteen minutes. With a pairing knife, scrape the beans from the pod into the milk-cream mixture. Discard the pod (or store it in sugar). Combine the sugar and yolks and stir vigorously with a whisk for thirty seconds or so (this will help the sugar to begin dissolving and will also help the egg to cook more evenly). Fill a large bowl with a 50-50 mixture of ice and water, and place a second bowl into the ice bath. Set a fine-mesh strainer in the bowl. Over medium heat, bring the cream just to a simmer, then pour it slowly into the yolks while whisking continuously. 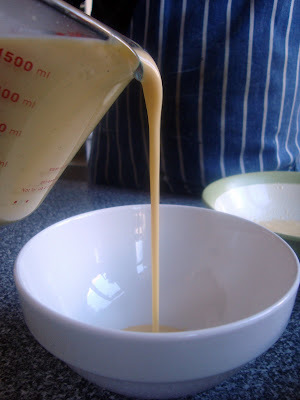 Pour the mixture back into the pan and continue stirring over medium heat until the mixture is slightly thick, or nappé—it should be completely pourable but if you dip a spoon in it, it should be thick enough on the spoon to draw a line through it—2 to 4 minutes, depending how hot your burner is. 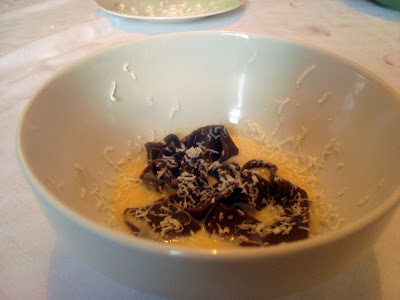 Serve a small amount (say 1/3 of a cup) of custard in the bottom of a bowl, top with a few strands of chocolate pasta. If you want to be extra ridiculous you can serve some white chocolate with a microplane at the table, to shave over like parmesan. i struggle to express how much i approve of this dish. I wonder if adding semolina to the dough might help with its elasticity? I thought about adding semolina, but I find that it adds a slightly grainy texture, and I wanted silkiness. I think next time I make this I'll add a coulis of a bitter fruit, maybe raspberry or something like that. The anglaise is quite rich. I am making this pasta, for a luncheon dessert and plan to top it with an orange ice-cream ...and a dramatic, shard of pistachio toffee. I think this should be a good flavour (and texture) balance for the chocolate pasta. I plan to try to make it into spaghetti...but will go for larger pasta styles...if the dough proves too fragile for this, which it may well do. I will let you know how I go! I love Chocolate Pasta! Especially with strawberries and ice cream. Absolutely delicious! Two ex-Perthites cook and eat their way around Melbourne. LIKES: bread; River Cafe-style Italian; meat; citrus; salt. DISLIKES: truffle oil; Simon Johnson; the word 'yum' or any permutations thereof. LIKES: mini foods; baking; any-mex; vanilla; condiments; thai; picnics; breakfast. DISLIKES: rice salad; pasta salad; avocado that isn't in guacamole form.